Tenth-century silver items are pictured on a table in Schaprode, northern Germany, on Friday. A 13-year-old boy and a hobby archaeologist have unearthed a "significant" trove in Germany which may have belonged to the legendary Danish King Harald Bluetooth. 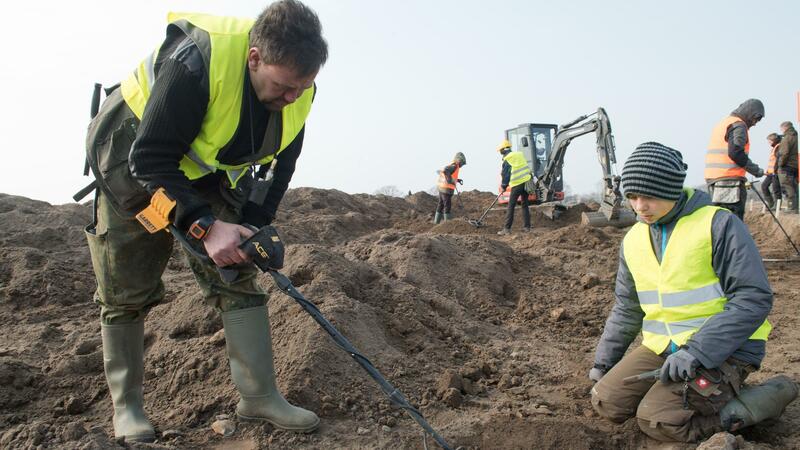 Amateur archaeologist Rene Schoen (left) and 13-year-old student Luca Malaschnichenko look for a treasure with a metal detector in Schaprode, northern Germany, on Friday. The two made their first discovery in January, then participated in a 4,300-square-foot dig that uncovered a larger treasure trove. Saxon, Ottonian, Danish and Byzantine coins are pictured on a table in Schaprode, northern Germany on April 13, 2018. Hundreds of coins — some split apart — were located in the dig, along with braided necklaces, pearls, brooches, a Thor's hammer and rings. René Schön and student Luca Malaschnitschenko were searching northern Rügen island with metal detectors when they found something they thought was aluminum — but turned out to be silver, Agence France-Presse reports. The archaeology office of Mecklenburg-West Pomerania, the German state where the items were found, did not provide the names of the discoverers, but credited a "volunteer" and a "13-year-old student" for the initial find. 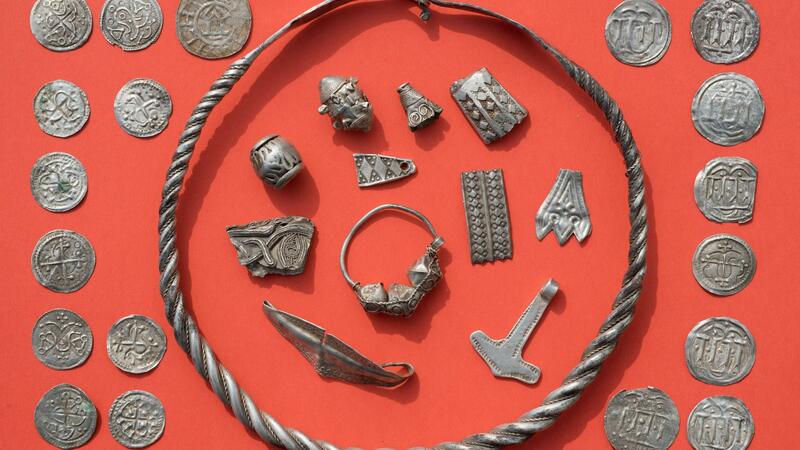 The two alerted professional archaeologists, and then helped recover of the rest of the trove — more than 600 silver objects dating from the late 10th century, the office says. They include coins, necklaces, brooches, rings, and a "Thor's hammer" (an amulet in the shape of Mjölnir). About 100 of the coins are from the reign of King Harald Bluetooth of Denmark: the largest find of such coins in the southern Baltic region, the office says. Harald I — his nickname is believed to come from a dead tooth that may have looked blueish — was a Viking king who united Denmark, conquered Norway and converted to Christianity. And based on the date of the stash, the state archaeology office says, it's possible that the hoard wasn't just from Bluetooth's reign, but that it was directly tied to the king himself. The oldest coin in the trove is 714 Damascus dirham, while the latest is a coin from 983, AFP reports. In the 980s, Bluetooth lost a battle with his son, Sven Forkbeard, and is believed to have fled from Denmark toward modern-day northern Germany. 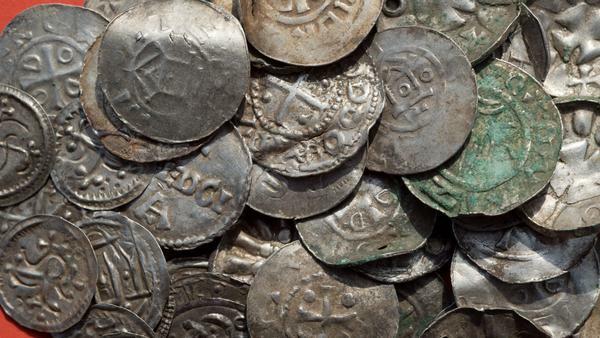 The newly discovered coins might be tied to his flight, the state office says — much like a hoard of gold found on the nearby island of Hiddensee in the 19th century. Anders Winroth, author of The Age of the Vikings, tells NPR that this is "very possible." "The timing is right," he says. "It is not really known exactly when Harald fled, but surely somewhere in the middle of the 980s, so the last coin from 983 fits nicely with that. "But one should always remember that there was a lot of movement of people at this time and a lot of buried treasure, so it is not by any means a certainty," he says. Michael Schirren, who directed the excavation, said the new find of silver coins was of "outstanding importance," The Local reports. "Similar types of coins have so far only been found in the territory of the Danish empire, such as at Husby and Harndrup, according to the excavation director," the news site writes. And in case you were wondering: Yes, King Harald Bluetooth is the namesake for Bluetooth wireless technology. An Intel engineer who worked on the technology, Jim Kardach, was reading about Vikings as the project developed. In his words, King Bluetooth "was famous for uniting Scandinavia just as we intended to unite the PC and cellular industries with a short-range wireless link." The Bluetooth symbol is a runic representation of his initials.